Increase your grip strength and decrease decrease arm pump. What is arm pump? Arm pump is simply the result of too much blood in a confined area. When we move our hand and wrist in a repetitive motion, or push,pull or grip an object, we can experience tightness in the forearm and a loss of grip strength. Most people recognize this as arm pump. 4 Arm Strong is a self-therapy device that creates traction on the forearm muscles toward the elbow while stretching in the opposite direction. This type of assisted stretch can expand the fascia and lengthen the forearm flexor muscles in the anterior and posterior compartments of the forearm, as well as create a stretch in front of the elbow that otherwise couldn’t be achieved. Anterior describes the inside or bottom of the forearm and posterior describes the top of the forearm. Expanding the fascia and stretching the forearm flexor and extensor group muscles can create more space in the forearm compartment, which allows blood to flow into the muscles with less constriction. Less constriction translates into less arm pump. 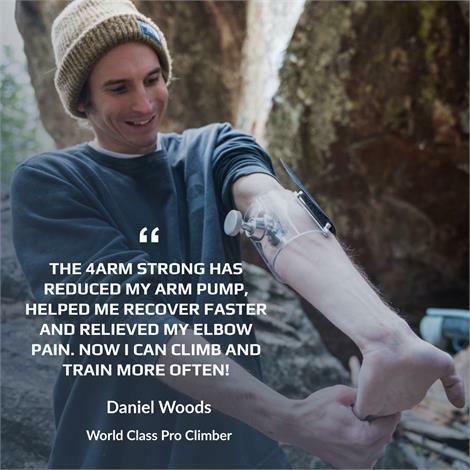 It also results in a freer, less restrictive movement which almost always results in greater grip strength and freedom of movement in the hands and wrists.